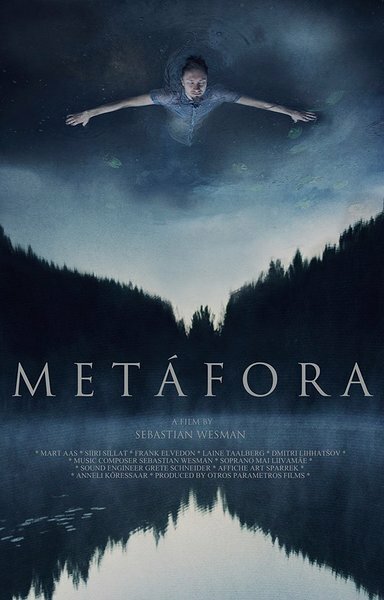 “Metáfora" (2015) is the first feature film of the filmmaker and composer Sebastian Wesman. It is a symbolic voyage inside the dream of an old woman. With an innovative cinematographic language, “Metáfora” takes us to a state of meditation where we experience different characters looking for the same answer. “Metáfora” was filmed in Estonia during the four seasons of the year and it is in the Estonian language. The film is divided into three stages each of which represents a stage of sleep, the depth of the dream of the old woman. The film unites elements of sculpture, music, theatre and photography – arts through which the director has transited before. Subtly modified natural spaces create a scenography that is both real and unreal at the same time. An equilibrium from which rises a new aesthetic. The film encounters us with compositions for soprano, string quartet, orchestra, solo violin and intervened ambiental sounds. All of which are original pieces composed for the film by its director. “Metáfora” includes the presence of professional actors and people who had never acted before. These opposite forms give an interesting dimension to the film. In other moments it is the landscape that becomes the main character. The film is written in a reflective and intimate narrative tempo. Represented in the film by the voice-over of the old woman. This voice blends with the different elements of the film, creating something similar to a cinematographic mantra. With a cinematographic language that is hypnotic, meditative and innovative in its aesthetic form, “Metáfora” is a film, an experience, a new encounter with the senses.